The clue’s in the name. Slap-bang on the wildebeest migration route, there aren’t too many better placed safari lodges in Africa than the Serengeti Migration Camp. Sweeping herds of wildebeest aside, the camp – and a ‘camp’ in the truest sense of the word it genuinely is – is made up of the most luxurious tents imaginable, packed with comfy leather Chesterfields, hard wood floors and safari-chic roof fans. Not many safaris in Africa give you the opportunity to spend a night up in a tree. At Tarangire Treetops Safari Lodge, however, rooms are hidden away high up in the canopies of a series of huge Marula trees. And quite apart from the novelty value, this treetop vantage point gives you amazing views out over the plains and, of course, fantastic wildlife-spotting opportunities including elephants, lions, giraffes, zebra and giant ostriches. Before you even so much as clap eyes on the rooms, Stanley Safari Lodge in Zambia has one major feather in its cap: a location right next to one of the world’s most remarkable natural phenomena, the Victoria Falls. Victoria Falls safari lodges are amongst the most coveted of all safaris experiences in Africa, and from the terrace at Stanley you can see the spray rising from the falls into the air. Fortunately, the rooms more than live up to the amazing setting, as well – a series of grand, colonial-style cottages with views out across the Zambian plains, they’re everything you could ask for in a luxury lodge for safaris in Africa. Over in neighbouring Tanzania, The Manor at Ngorongoro is appropriately named. 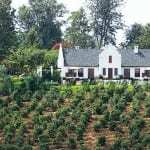 Surrounded by acres of coffee estate and with roll-top baths and chandeliers hanging from the (straw-covered) ceilings, it’s a real safari take on a grand, colonial manor house. 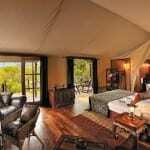 Like one of two of the other luxury lodges on this list, it’s also got a million dollar location in its favour – right next to another of the holy grails of safaris in Africa, the spectacular Ngorongoro Crater. Waking up to a coffee (fresh from the estate) and views out across the caldera, shimmering in the morning haze, is a truly unforgettable experience. 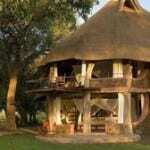 The South Luangwa Safari House undoubtedly has the most genuine design cred of any of this pick of luxury lodges. The interiors were put together by darling of the glossies, Neil Rocher, and combine plenty of stylish touches with an environmentally sound approach to the use of natural materials. 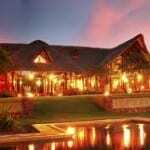 Safari-wise, it’s got impeccable credentials, too – set at the foot of the Chindeni Hills, it looks out over a seasonal lagoon. After a hot day out in the bush, you can slip into the infinity pool with a cocktail as the sun sets and watch the animals come down for their evening drink. A special moment. That’s your lot. 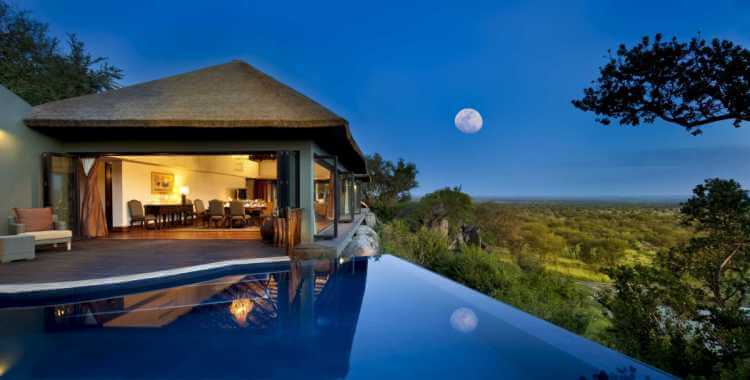 What do you think – have you indulged in a luxury safari lodge that you think should be on this list? If so let us know by joining in on the comments section below. 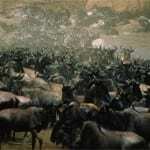 I’d also recommend the Ngerende Island Lodge – http://www.ngerende.com – in the Masai Mara. 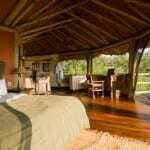 A nice exclusive lodge, with only seven luxury suites in its main lodge at the edge of the Mara river. Their mobile luxury camp called Ngerende in the wild is an experience like no other in the Masai Mara. Amazing !!! You explained it real nice. Yeah I’ve been to Tanzania and stayed at Manor at Ngorongoro which was quite nice one.